From the FOREWORD. In writing this book my aim has been not only to show the student how to manage and use the various possibilities, but also when to introduce them — a point which is obviously of prime importance. One so often encounters students who can talk glibly about the "treatment" of all kinds of chords, but who seem not to have the slightest idea of when to use them, or how to know when their use is implied in a given part. While the harmonisation of a melody or a bass is to a great extent dependent on the musical sensibility of the student, it has to be realised that certain melodic progressions imply, normally, certain definite harmonies, and these implications I have tried to make clear. Elementary work, at least, is largely compounded of commonplaces, and my object has been as far as possible to show how the underlying commonplace may be "spotted." An appendix on Figured Bass, for the benefit of those who use it in teaching, is published separately. It provides instruction and exercises on each chapter. 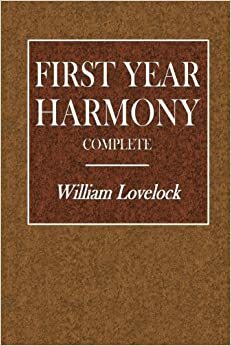 The chapters and material have been arranged not only to provide a good grounding, but also to cover what is generally needed in the more elementary Harmony examinations, such as the paper work of the A.T.C.L., A.R.C.M., and L.R.A.M., and the whole book is based on my own practical experience in the teaching of Harmony. An attempt has also been made to show how exercises can be made reasonably interesting and flowing, by the early introduction of the unessential, and in particular Suspensions, which are often left to a later stage on account of their supposed difficulty. Actually they are easy enough to manage if dealt with on the lines indicated. The treatment of certain matters has been deliberately restricted and limited for the sake of clarity and simplicity; Modulation, for example, has been dealt with only in an elementary manner. The student is recommended to follow this book by my "Hints for Paper Work Candidates" (Hammond & Co. which will serve for general revision. Ample supplementary exercises are to be found in my "108 Exercises in Harmonisation", —W. Lovelock.